With a production period from 1969 to 1979, at the end of the 60s Rolex launches the reference 1680 and with this was born the Submariner model which clearly indicates the date on the dial, using a small window with Cyclops for an easy-reading. 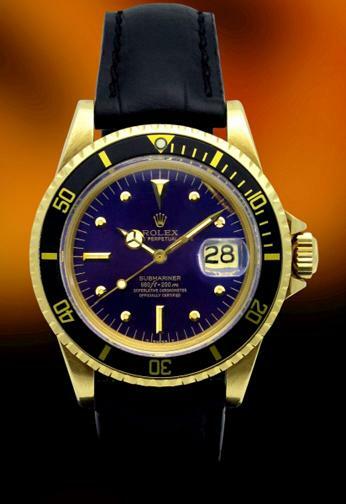 The first version of Submariner Date was based on steel but then Rolex added a gold version. The main features are Submariner with non-quick Date, automatic chronometer movement Caliber 1575, Oyster case with a water-resistance up to 200 meters, bi-directional turning bezel with specific functions for divers and Alligator Leather Band. These This beautiful piece comes with Purple dial, extra luminous markers and Plexiglas crystal.